2 Main Meals Free with Rewards Card at Table Table 500 points required! Mums Eat Free on Sundays After 2 pm with Tasty Rewards Card at Table Table Valid after 2 pm on Sundays! Table Table is a place to go for traditional English pub food and classic British style breakfasts, brought up to date for the 21st century with things like free wi-fi, premium quality coffee, and some healthy options on the menu too! Family friendly and with some great deals for food for the kids, Table Table is a great place to dine for any occasion, from a night out with friends to a family lunch, or breakfast before a big day of work or a busy day out. You can make savings on the already affordable prices at Table Table when you come to vouchercloud to find the latest Table Table discounts. Whatever the meal and whatever the reason, Table Table is always a place to find satisfying food you and your family will love! How do I use my Table Table voucher? Add Table Table to your watched restaurants at vouchercloud and you can save every time you fancy a meal at your local pub! Table Table is a very family friendly place to eat, and can be a good place to grab breakfast with your kids as children can have breakfast for free when eating with a paying adult at many Table Table restaurants. Where is my nearest Table Table pub? There are pubs that house Table Table restaurants all over the UK, including in Northern Ireland. You can see a full list of them here, or search by location to find your nearest on the homepage. Do Kids eat free at Table Table? Table Table knows that taking the whole family our for breakfast, lunch and dinner can be a stretch on your budget. That's why children can eat breakfast for free, or eat before 5 pm for as little as £1.99. Just check the promotions online at your local Table Table before you book! How can I get Table Table Tasty Rewards? To join the fantastic Tasty Rewards scheme, you'll need to nip down to your local to collect a Rewards Card. Then follow the steps to activate your card online. now eat, drink and relax while you rack up the reward points! You can reach Table Table online via their contact form - there is also an FAQ section which may handle any common queries. If you want to get in touch with a specific pub, you can find your local using the online pub finder. You can discover the specific opening times of your local by using Table Table's online pub finder. 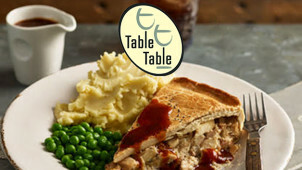 Table Table is a popular restaurant with menus in British pubs all over the UK. They specialise in high-quality versions of pub favourites at great prices, and you can get some real bargains on eating out at their pubs when you use the current Table Table vouchers here at vouchercloud. Table Table restaurants are open for breakfast, lunch and dinner, and offer affordable and tempting starters, mains and desserts, as well as of course all the great drinks you'd expect from a proper British pub! You can join the Table Table Tasty Rewards loyalty scheme and get some exclusive discounts, as well as saving up points towards rewards like free food and drinks! You can join by picking up a card at any Table Table location and activating it on their website. Then just bring it along to claim your points whenever you go. Get social with your local on Facebook, and you'll be the first to know of top offers and events at a Table Table pub near you. From Christmas cheers to Mother's Day treats, Table Table will help you celebrate special occasions. We'll always have money-saving Table Table offers to cut the cost of food, drinks or the entire bill; giving you the chance to kick back and relax and enjoy special days with friends and family.